and quality of life in their home or community. loved one, trust in New Vision Nursing & Home Care. compassionate about helping others, we want YOU! New Vision Nursing & Home Care LLC is a home health agency that is privately owned and operated by a Registered Nurse. New Vision Nursing and Homecare in Wapakoneta provides professional, compassionate in-home care including Occupational Therapy, Speech Therapy, Massage Therapy, Physical Therapy, Visiting Nurses and Home Health Aides to individuals, while maintaining their independence and quality of life. Teresa Doseck, a Registered Nurse and owner of New Vision Nursing and HomeCare, has seen firsthand the difficulties people have in the community obtaining the resources needed to live their lives as independently as possible. Our goal is to provide professional compassionate care to individuals, while maintaining their independence and quality of life in their home or community. Would you like to speak to a registered nurse about our services? Our caring staff is here to provide professional compassionate care to your loved ones, while maintaining their independence and quality of life in their home or community. What everyone is saying about New Vision! I would highly recommend New Vision Nursing and Home Care to anyone looking for either part time or full time home health care! Silas D.
New Vision has been phenomenal in caring for me at home. I have been a patient of New Vision for several years now, and have loved every minute. The aides that they provide me are amazing, and kind. I am so grateful for their staff, keeping me at home and out of the nursing home. I would highly recommend New Vision to anyone. Kate M.
Thank you for your excellent care of Nana. 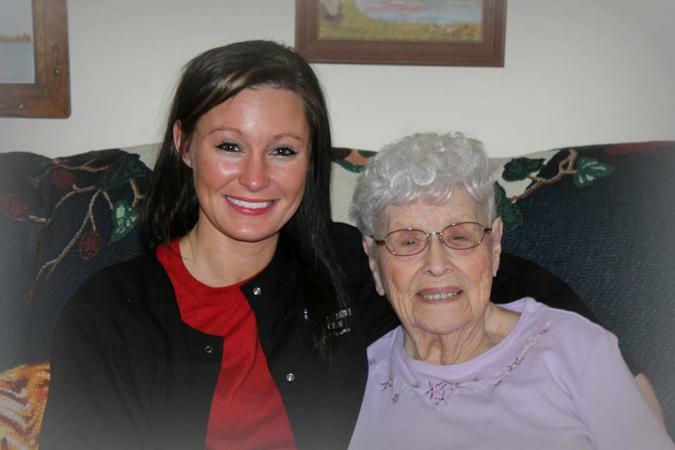 We are blessed to have all of her caregivers as a part of our family. Love, The Odenweller Family Barbara M.